"My mother had a creative way of using the apple cores and peels leftover from making apple pie: to make homemade apple juice. Store-bought apple juice is tasty, but it has a strong, distinct flavor with almost a hint of bitterness. To those with sensitive palates, it can be a little strong at times. Homemade juice, however, tastes surprisingly different as it is lighter and pleasantly sweet without the kick. Besides using a juicer, this is a super-easy way of making apple juice." Place the peelings and cores into a saucepan, and stir in the water. Bring to a boil, reduce heat to a simmer, and cook, stirring occasionally, until the water picks up the apple flavor and color, about 30 minutes. 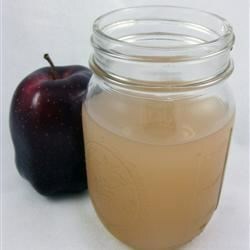 Drain the apple juice, discarding solid pieces, and stir in the sugar until dissolved. Allow to cool before drinking. Apple seeds contain amygdalin, a toxic substance. the juice was very good but i boiled a whole apple first. This is how to make apple juice and I love apple juice and I would like to try it with NO sugar because I hate sugar.